Thank you, come back and see us soon! I visited this facility looking for my mom. The staff was great and so welcoming!! We really enjoyed the lunch too. Great experience!! Thank you! I am so pleased you had a Great Experience, we appreciate your feedback and your business. Thank you for taking the time to say such kind words about the Legacy of St Anthony, we appreciate your feedback. This facility is very nice and clean at anytime I have visited. The staff all go overboard to please anyone they come in contact with. Their food is very good and pleasing to the eye. The community is small and you can feel the family ambiance in all interactions. The Legacy seems to be hopping with activities and fun. I like the size of the rooms the windowed units provide such wonderful natural lighting. Thank you so much for your kind words. We really appreciate you taking the time to share your experience with us. We count ourselves lucky for customers like you. I visited my great aunt from out of town. Very nice community. The staff I saw were really nice and inviting. The building is really pretty. I liked that they had activities going on. Seemed like a really good place. Thank you for your review. 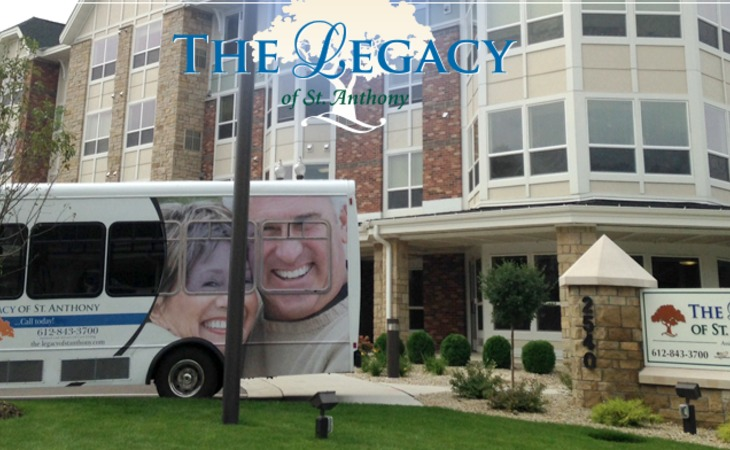 The Legacy of St Anthony works diligently to provide all kinds of interactive activities and one of our top priorities is to participate in the fun. I like The Legacy of St. Anthony, but it is not flexible. The rooms are small but very nice. Each unit has its own washer and dryer. It is a very nice place, but it is in the higher end cost-wise and less flexible. They were very welcoming at The Legacy of Saint Anthony. There appeared to be a lot of activities for the residents. The rooms were very nice. We like that it was a smaller building. There was a common area on the main floor for the activities. The Legacy of St. Anthony is well staffed and a lovely place with excellent meals. My husband seems happy. He has a good-sized room with a beautiful bathroom and living area and a lot of windows. They have singing and social groups. He goes into the sunroom to do jigsaw puzzles and eat his meals. The staff is extremely friendly, very helpful, and chit-chat with me It is fine. I looked at The Legacy of St. Anthony, which I think is a phenomenal place if you like urban locations. And it is not too close to downtown. They have a very nice campus. The food was very good. I met with the people that run the place. I had a lunch with a couple of staff members, and it was very nice. They actually have an apartment complex that if you're going to have guests come in from out of town, they have available apartments for people to stay in. It was quite lovely, and it was very polished and very nice. It's a very nice place. Everything is wheelchair friendly. The Legacy was a nice place, and it was not far from my home, but it was a bit far from my son and daughter. However, my problem was they needed $3,000 for placement, which they reduced to $2,000, and that would put me in a financial bind. The residents were relaxed, and they also had male caregivers, which was a huge plus for me. I thought it was very homey, and I was impressed with it. The Legacy is a nice place that has a little pond with ducks in it and a Mexican restaurant nearby. It’s a good location, but it’s in the suburbs, so sidewalks don’t exist. They had an interesting room configuration, with two bathrooms and two kitchens, so it would have been ideal for us. The Legacy of St. Anthony was very nice with a nice atmosphere but too expensive for me. The staff was very helpful, nice, and accommodating. They gave me lunch. The dining area was very nice, very clean, and appealing. I think people would like to go there to eat. It’s a very nice place. The lady that was supposed to meet with me had some other appointment all of a sudden, but she set up me with another guy. We were very impressed with Legacy. It was very clean, and it was brand new. We met a couple of gals that showed us the place. There was a pool in the place next door. They had a lot of exercise rooms, big community rooms, and all that stuff. I like that The Legacy of St. Anthony was close to my brother's house. The staff working there is OK, but I haven't been impressed since we moved her. They told us that everybody was wonderful and that she'd get all this attention. It hasn't been that great, and it has been pretty average. I haven't been that impressed that in 1 out of 5, I would give them a 3. As for the food, from what we expected or what we were told, it was kind of meeting expectation pretty much. They told us that she will have five entrée choices at lunch and dinner. You really get one rotating one; the other four are the same every single day. The sanitation has been good. I think it is fine. I think Legacy of St. Anthony is very nice. It's lovely; it's small. They just opened up. I looked at two apartments, and they're all different but very nice. The rooms were beautiful. They are 707 sq.ft. and they're good-sized rooms. Very nice, very modern. All the rooms come with a washer and dryer. There are 70 apartments, so it's a small operation. The people who work there are very, very friendly. I basically chose it because of the location. We foster relationships built on trust, integrity and community spirit. We are committed to exceed your expectations in every interaction. We focus on building relationships that positively impact our community and create memorable experiences. That is our service commitment to you. Lang Nelson has over 45 years of experience professionally managing properties and is the proud recipient of over 100 MADACS Awards—Minnesota’s highest award for excellence in rental property management, assisted living communities and customer service. Enhanced Care suites, High-speed internet access and common area wifi, State-of-the-art personal monitoring system, The Connection (Internet Cafe), Wellness Center (Fitness), Silver Lake Room (Theatre), Ida Marie Restaurant and Ida Marie Bistro for fine dining experiences, and much more! What should caregivers and potential residents know about The Legacy of St. Anthony?